We treat all animals with the dignity and respect they deserve. Exceptional care is top priority at GeckoBoa Reptiles. 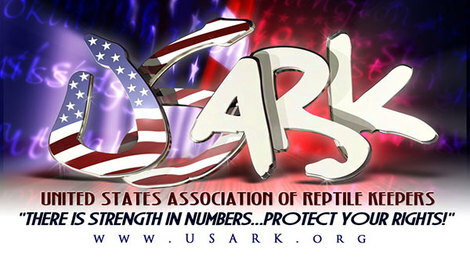 Please support USARK to help protect the future of our hobby. We are reptile shipping experts. Thousands of geckos shipped and zero dead on arrivals to this date!! I can not say in words how extremely happy I am with the most recent purchase from you. The photo's are great but to see them in person is so much better. I have now made five separate purchases from you & I have to say after breeding Leopard Geckos myself for 11 years and made other purchases from other well known breeders, these from Geockoboa have got to be the best. I look forward to adding to my breeding groups from you. Thanks, again, John Byer of JB Leopard Geckos. John Scarbrough of Geckoboa is a great breeder to buy from he answers your questions promptly. He is responsible for 3.5 of my current 6 leos. "I must say John is an exceptional breeder and in a class of his own". "Just wanna put out there how AWESOME John from GeckoBoa is!! !...A+++++++++++++++ Breeder and I recommend to anyone!!!!!!!" ...and many more on our ﻿Facebook page﻿. Go see why we have a 5 out of 5 customer service rating. 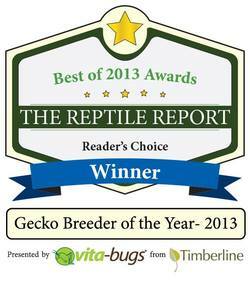 Thanks to everyone who voted for us to win 2013's gecko breeder of the year! !